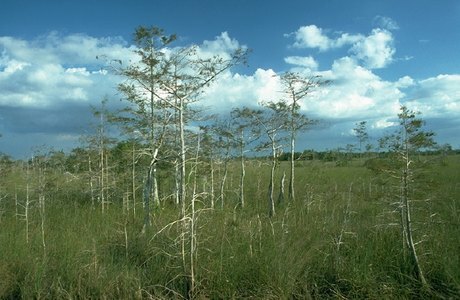 Everglades National Park contains both temperate and tropical plant communities, including sawgrass prairies, mangrove and cypress swamps, pinelands, and hardwood hammocks, as well as marine and estuarine environments. The park is known for its rich bird life, particularly large wading birds, such as the roseate spoonbill, wood stork, great blue heron and a variety of egrets. It is also the only place in the world where alligators and crocodiles exist side by side.